1. Carmines: This family-style restaurant serving Southern Italian cuisine is well worth the wait. Carmine’s saying is, “like a Sunday afternoon at Grandma’s” and it feels that way! Order platters of antipasto, pasta, seafood or meat dishes topped off with a dessert. 2. Los Tacos No. 1: For truly amazing tacos look no further than Los Tacos No. 1. Many Mexican or Californian visitors are doubtful they will find “real” tacos in this big city, but this is the absolute closest it gets in NYC. Three Mexican and Southern Californian friends founded this restaurant to bring authentic tacos to the East Coast. It feels like a roadside stand with no seating, only counters to eat your food. The Times Square location is their second outpost; the first location was a slightly smaller counter in Chelsea Market. My favorite tacos are carne asada (beef) and adobada (pork with pineapple) tacos. There are also pollo (chicken) and nopal (cactus -vegetarian) tacos. When they ask if you want corn or flour tortillas, the answer is always corn. They flatten these tortillas right in front of you. The guacamole sauce comes on every single taco, without charging you extra! 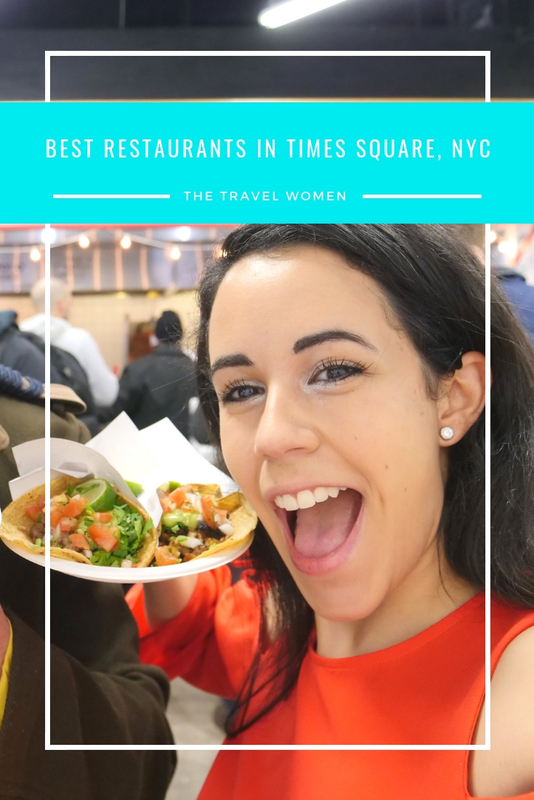 These tacos are very affordable for a New York City meal ranging from $3.25 to $3.75 per taco. There’s even a secret menu with a taco shell made entirely out of cheese. To drink you can enjoy a Mexican soda, which is sweeter, or fresh jugos (juice) like the horchata, jamaica or tamarindo. 3. Jollibee: Jollibee is a Filipino fast food chain with a cult-like following. It all started in 1975 in Cubao as a Magnolia Ice Cream Parlor. The first Jollibee store in the USA was opened in 1998 in Daly City California to serve Filipino and Filipino-American families in the area. It is well-loved because it embodies a familiar feeling of home. There are now 34 locations in the USA, mostly in California. The first Jollibee on the East Coast was opened in Woodside, AKA Little Manilla, Queens. This Times Square opening is the first open in Manhattan. What should you order? Jollibee is well known for its Chickenjoy and gravy, which is fried chicken that’s crispy on the outside and juicy on the inside. You can order a Chickenjoy drumstick with the Jolly Spaghetti, soft pasta with uniquely sweet Filipino style tomato sauce and cut up red hotdogs, topped with cheddar cheese! One of their most popular sweet desserts, which is like a Filipino milkshake, not yet available on the limited menu at the new Times Square location is the halo halo. For dessert you must order their famous fried Peach Mango Pie, which is all the right amount of flakey and sweet. Jollibee’s new Times Square location opened on October 27, 2018 at 609 Eight Ave between West 39th and 40th streets. When it first opened the first 40 customers received free Chickenjoy for a year! 4. 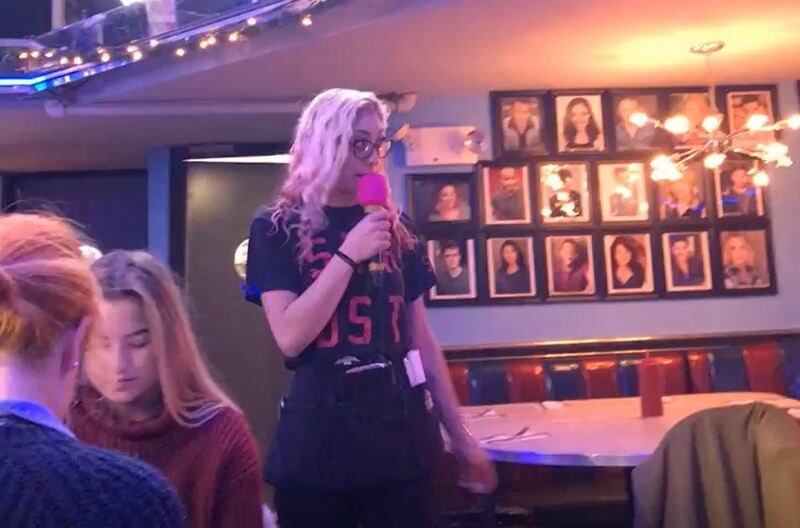 Ellen’s Stardust Diner: Before you dismiss this “Home of the Singing Waitstaff” diner as too touristy, just try to not sing along! 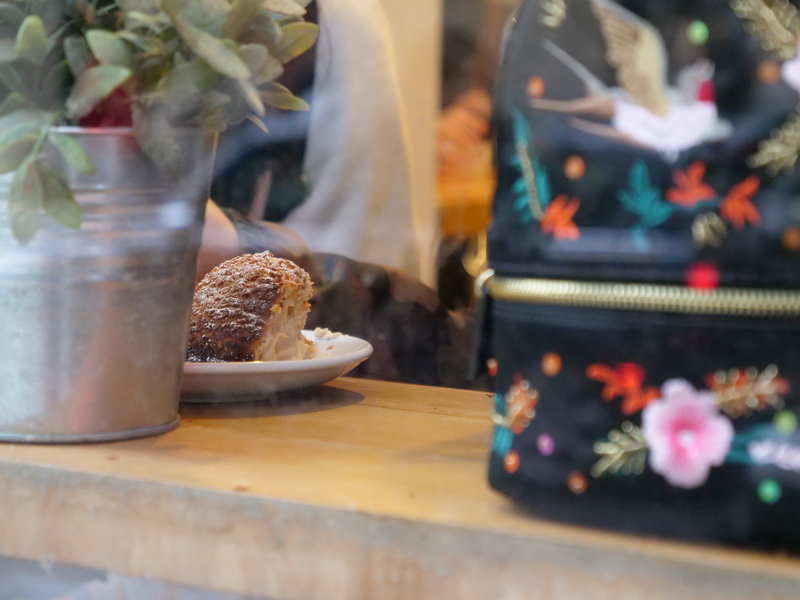 This is a family-friendly #onlyinNewYork kind of diner. Get there early to beat the line but be rewarded once inside you can enjoy food and show by the singing staff. A few steps from Broadway, future stars practice here before they make it to the Broadway stage. They also collect donations (separate from the tip) to only to be used for acting or singing lessons. 5. Bibble and Sip: Great coffee is hard to find in Times Square so look no further than this family run business. Sip a gourmet coffee, espresso or specialty lattes include matcha jasmine and lavender. Baked in house favorites include cream puffs and the alpaca bar, which includes apple, caramel, golden raisins, chocolate chunks and strusel. 6. Junior’s Cheesecake: If you still have room after the delicious reuben sandwich, you must try their specialty, the best New York style cheesecake. Junior’s started in 1950 in Brooklyn and now has expanded to include this new large location in Times Square. 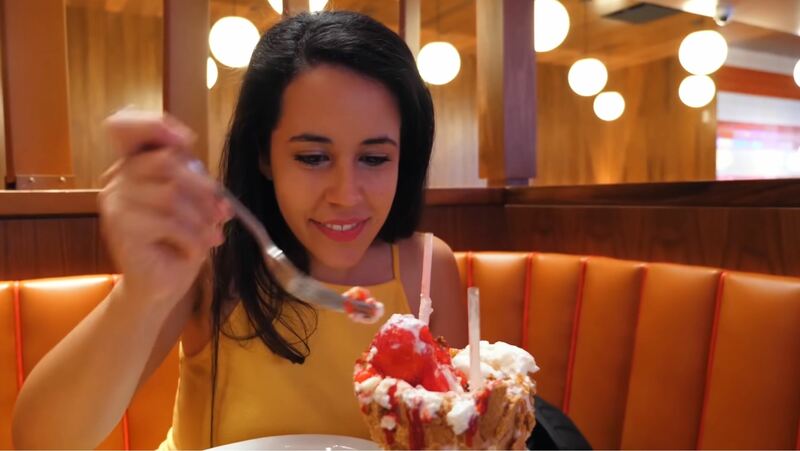 You can even get a slice of cheesecake on top of a milkshake! 7. Becco: Located just steps away from some of the top Broadway theaters, Becco is a Lidia Bastianich restaurant. Becco means “to nibble or savor something” in Italian. You must come here hungry and you must order the unique unlimited pasta deal. Unlimited pasta means you can continuously add pasta to your plate from the waiters’ hot skillets. There are three different specialty pastas daily, including a vegetarian pasta. This is the best way to try different pastas! Which restaurant are you most excited to try in Times Square? Comment below!